Yesterday was Day 1 of the EMC! We kicked off this morning with yours truly offering insight on what bankers can expect in our rapidly changing industry. Much of the upcoming change will be technology-related, but the economy and interest rates are poised to alter the banking environment as well. We began as bankers often do with a discussion of interest rates. There are high expectations that the Federal Reserve will raise short term interest rates sometime this year. While the timing may be later than originally expected, the Fed will look a bit silly if they don't act after all the warnings to financial markets of an imminent change in policy. If everyone knows it is going to happen, so why should there be so much concern? Consider that it's been ten years since there was Fed tightening cycle. At that time, the Fed raised rates over a 3 year period for a total of 475bps. No one expects that much of an increase this time, but the end result is still unknown. Look around your office and take note of members on your management committees that were around the last time the Fed went through a tightening cycle. Is there anyone? If there are people who remember, don't forget to pull from their experience. Also remember that most people in the bank do not have experience with a cycle of rising rates. It will affect credit quality, capital levels and liquidity. It will hit NIM with loan floors dampening increases in yield on the asset side but also is likely to cause rising deposit costs. Higher rates are going to affect everything in the bank. Looking back at the past 7 years, the number of banks in the US has shrunk from 8,354 to 6,509, mostly through consolidation. Surprisingly, banking assets are up 19%, loans are up 5% with a 19% increase in CRE and C&I. At the same time, construction lending is down 62% and SFR is down 18%. Good news going forward, the end is in sight for post-crisis regulatory changes. Basel III, Dodd-Frank are already underway, CECL is the only piece of the puzzle remaining and those rules are being finalized now. There should be a quieter period on the regulatory front after this. Technological change will be the driver of the biggest changes for banks. 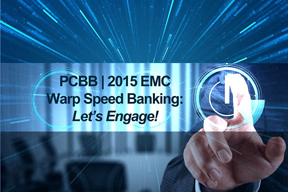 Customer adoption of electronic access has created a seismic shift for banks everywhere. Managing branch size and personnel has been challenging, but in the end the cost savings of customers using that access is significant. Current estimates on the cost of processing a transaction: in person with a teller $4.00, video teller transactions cost $2.00, $0.60 ATM, $0.14 mobile. Every aspect of our banks will be changing over the next few years - we must remember to be flexible, manage as pro-actively as possible and to not forget to have fun. Speaking of fun, the next person on the stage was the Secret Service expert on cyber-crime. His presentation was nothing short of chilling, with stories of 20-something hackers from Eastern Europe stealing 40mm credit card files and then selling the data online to anyone who cared to go shopping. On the "dark web", the criminal part of the internet, there are Amazon-type web sites selling credit card data. Choose from a drop down menu to pick your country, the issuing bank etc. Stolen data for 5 cards costs about $12. The phase-out of magnetic strip cards will make that particular line of business obsolete, but in the eyes of the Secret Service (which BTW was originally formed to fight financial crime, not specifically to protect presidents), data theft will migrate to a different method and go on unabated. Data theft is a global enterprise and community banks risk their reputation if it appears they have not taken adequate steps to protect their customers. Bankers will have to work hard to keep up, and at a minimum should be certain their merchants use secure POS systems, and that they update and upgrade operating systems on ATMs. Cyber insurance is a developing product and should offer some protection, so banks should look into that as well, but tread carefully. Especially, every bank should have a data breach response plan and have determined a step by step process to follow in the event of a breach. More on regulations and lending from the conference tomorrow, plus some banker stories from the front lines. Stay tuned! Treasury yields rose 2bps as Greece and its lenders appear closer to an agreement. Yields are unchanged ahead of this morning's upcoming Case-Shiller release. The latest survey of 50 business economists by the National Association for Business Economics (NABE) projects 2015 GDP will come in at 3.1%, despite the slow start in Q1 caused by weather. The latest update from the FOMC shows GDP is projected to be 2.3% to 2.7% (2015); 2.3% to 2.7% (2016) and 2.0% to 2.4% (2017). A study by Goldman Sachs found 30% of millennials said they did not consider buying a home a priority (but they did say it was important). CNBC reports research by American Express and Dun & Bradstreet finds middle market companies with revenue between $10mm and $1B created 91% of net new jobs over the past 7Ys. Analysis was based on review of the 19mm businesses in D&B's database. A survey by WalletHub finds the states that are the most dependent on the Federal Government (based on return on taxes paid to the Feds, federal funding as a percent of state revenue, number of federal employees per capita and the number of civilian non-defense federal employees per capita) in order are: NM, MS, KY, AL and MT. Meanwhile, the states identified as the least dependent on the Federal Government in order are: NJ, DE, IL, MN & KS.